Viola M. Klimek, age 95, of Urbank passed away peacefully Thursday, November 15, 2018, at home surrounded by her family. Mass of Christian Burial will be at 11 a.m., Tuesday, November 20, 2018, at Sacred Heart Catholic Church in Urbank with Fr. Peter VanderWeyst and Deacon Craig Stich officiating. Burial will be at the church cemetery. Visitation is 4-8 p.m., with a 7:15 p.m. Christian Mother’s Rosary and prayer service to follow at 7:30 p.m., Monday at Sacred Heart Catholic Church in Urbank. The visitation will continue one hour prior to the service. Viola Mary was born on July 6, 1923, to Peter and Barbara (Reger) Koep at home near Urbank. She was baptized and confirmed at Sacred Heart Catholic Church in Urbank. Viola attended Sacred Heart Parochial School through the eighth grade. She was united in marriage to Alexander George Klimek on June 21, 1943, at Sacred Heart Catholic Church. Following their marriage they lived a short time in Wadena and Millerville before making their home in Urbank for 72 years. 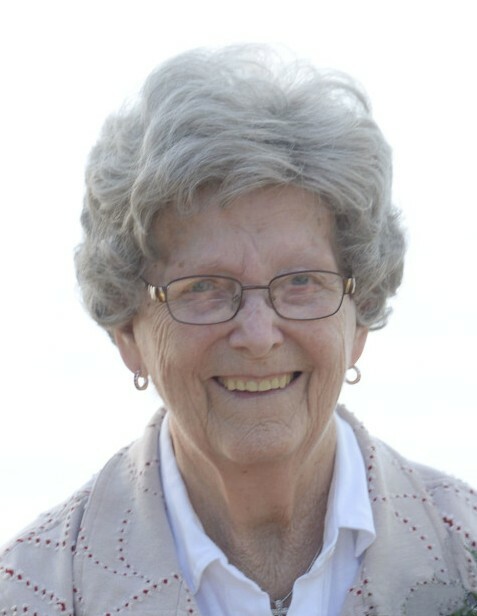 Viola held various jobs through her life including painting and staining, providing Urbank news for the Independent and Echo Press, cleaning houses, and helping Alex make custom cupboards and hutches. Above all other jobs, her favorite was being a stay-at-home mom to her children and caretaker for her brother-in-law, Mathias Klimek for 28 years. Her days were filled with quilting, canning, cooking, baking pies and bread for family, friends, and the church. Viola also tended her vegetable and flower gardens. She was a lifetime member of Sacred Heart Catholic Church and its Christian Mothers and church choir. She volunteered for many church occasions, Meals on Wheels and quilting for missions. She enjoyed attending various church bazaars, playing bingo and cards, and going on casino trips. Viola also enjoyed watching baseball, especially the Minnesota Twins and Urbank Bombers. She loved spending time with her family at outings and events. Some of her favorite places to travel included Florida, Colorado, and Las Vegas. She was preceded in death by her parents; husband, Alexander; two daughters, Mary as an infant and Virginia; son, Vernon; three sisters, Helen, Eleanor, and Caroline; five brothers, Arthur, George, Alfred, Harry, and Edmund; son-in-law, Kenny; grandbabies, Jesse and Anya; and great-grandchildren, Jon, Evelyn, and Grayson. Viola is survived by her daughter-in-law, Evie Klimek of Urbank; nine children, Sylvia (Jules) Volk of Andover, Paul (Patty) Klimek of Alexandria, Ruth (John) Jesnowski of Evansville, Grace Suchy of Miltona, Joseph (Sharon) Klimek of Urbank, Mary (Larry) Waldorf of Alexandria, JoAnn (Tony) Kelly of Garfield, Viola (Joe) Dorn and Laura (Tony) Fiedler both of Parkers Prairie; sister, Evelyn Roers of Alexandria; 48 grandchildren; 93 great-grandchildren with three on the way; and numerous nieces, nephews, and other relatives. Pallbearers are Jules Volk, John Jesnowski, Larry Waldorf, Tony Kelly, Joe Dorn, Tony Fiedler, and Tobby Klimek. Honorary pallbearers are her grandchildren and great-grandchildren.